If you leave a comment with your URL, we'll list your link under our post (making it count for Technorati & Google). To join Thursday 13, click the badge. Join BN-Politics' link-exchange: add us to your blogroll & email us. 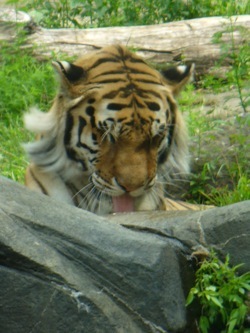 Tiger cleaning itself (or licking a rock), Bronx Zoo. I certainly need a break from politics -- and what better way to take one than doing a Thursday Thirteen? 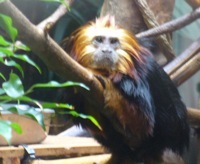 Mine is on animals that I saw at the Central Park Zoo and the Bronx Zoo. They're both worth seeing. 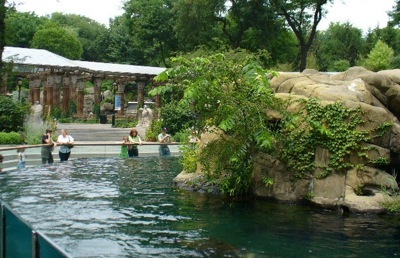 The Bronx zoo is a fair subway ride from midtown Manhattan, and it takes most of the day to get through the zoo. 1. 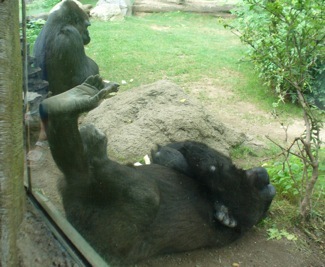 Gorillas: one "sleeping" with foot on glass, one with Back turned (Bronx Zoo). For a while, most of the gorillas refused to come down toward the glass. Then, the leader moved toward the glass, and many followed. At first, they turned their backs and ignored us -- like they were telling us to go to hell. I don't blame them: they were in captivity. Eventually, they started turning around. These two guys held firm..
2. Babies Playing at foot of hill. 3. 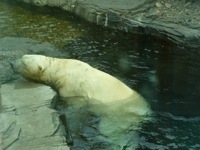 Polar Bear (Central Park Zoo). The poor thing just kept swimming back and forth, back and forth. I think there were two, but one was napping. 4. 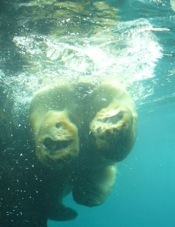 Polar Bear's massive paws kicking off the glass as he swam. 5. 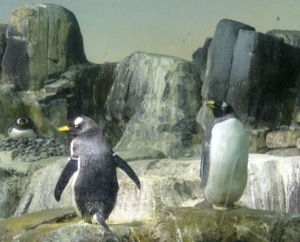 Penguins (CPZ). The one at back left might be laying on eggs. 8. A big cat of some sort (BZ). It has large brownish spots. 9. 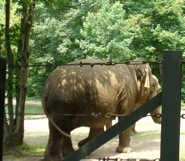 Elephant (BZ). I was on the train ride, so it was hard to get the shot. That and she wasn't feeling social when we stopped for photos. 10. 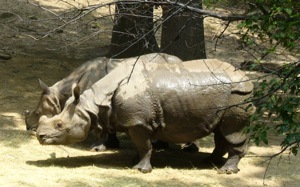 Rhinos (BZ). Lovers, perhaps? 11. 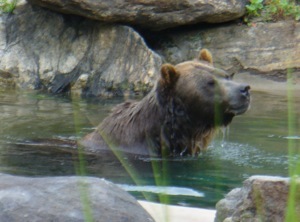 Grizzly Bear swimming (BZ). 12. Giraffe nibbling at tree (BZ). 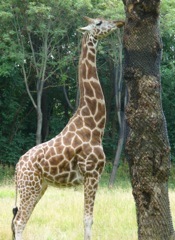 The zoo puts a net around the tree to keep the Giraffe's from stripping all the bark (I heard). 13. Sea Lion Tank (CPZ). The brown shadow under water is a sea lion (bottom, center). I like the fact that these animals appear to be in a natural habitat. I hate when people cage animals. Very nice pictures. I love the zoo! My son's favorite is the zebra, and mine is the tigers. These are all great shots, and I agree that it is nice to see them not caged up. I love zoos, but haven't been to one in a while. Thanks for reminding me that they are great places to visit. Great photos! I do love seeing the animals. We have a zoo right next to our house so we go every once and a while. We see it's back side almost every day. 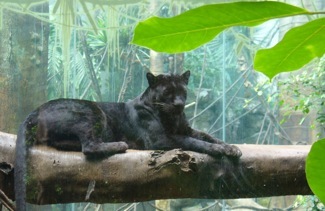 My constant rhetorical question: Why are we always fascinated with zoo photos and always take a camera when we go? I don't mind admitting I shot about a hundred or so images of the pandas visiting Memphis. These are wonderful. I love the penguins! Great pictures! 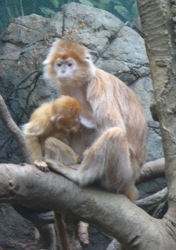 I wanted to visit the Bronx Zoo last time were went to NYC but got out voted in favor of Coney Island. Fun TT!!! I'm a huge animal lover. My favorite is the penguins. So cute. I'm actually going to the Detroit Zoo next week. fun!! It's been far too long since I've been to a zoo. Thanks for sharing. Happy T13! Great pictures. Yeah, that tiger looks like he's licking a rock. hahahah I was totally hoping to come by and read some politics ;-) Lovely shots, the first one cracked me up. Great shots. We do not have polar bears in our zoo anymore. I love them! Love the zoo pics. I used to work in a zoo -- small and quaint and seriously lacking in exotic species! - but fun none-the-less. I love zoos! Thanks for the virtual trip to the zoo! I've been itching to go back to our zoo. I love spending the day there and checking out the animals. Looks like you had two good adventures.